Ride into the sunset with our enigmatic hero! 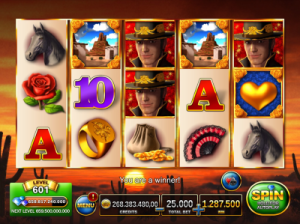 Enjoy the new scatter symbol and win big in the Free Spins Bonus with the new Held Wilds! 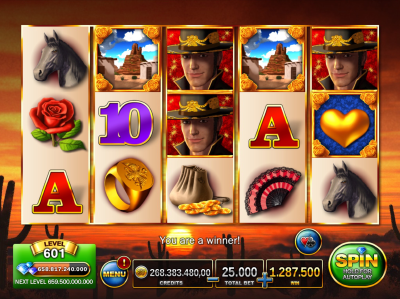 Play on 25 win lines and enjoy two thrilling bonuses! 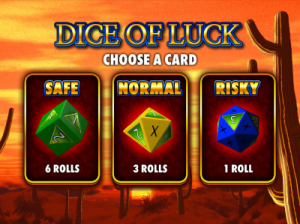 3 Desert Town Symbols trigger this bonus. 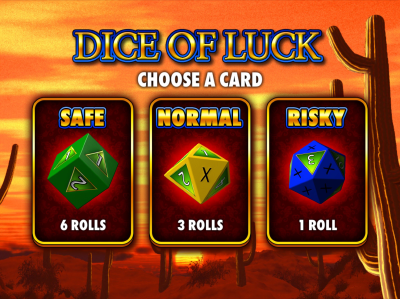 Choose if you want to throw the 6-sided die 6 times, the 10-sided die 3 times or the 20-sided die once. The numbers you roll increase your win according to the win table. Good luck! 3 Heart of Gold Symbols trigger this bonus. Enjoy 10, 20 or 30 Free Spins on special reels! Win up to 35,000 times your bet with the new Held Wilds! A higher bet awards more diamonds! Play maximum bet to unlock all slots fast!